GCSE grade structure is changing – is it getting more difficult?. Well yes, and one of the first signs of this was even before 9-1 came in: the first GCSE Maths question that went viral on Twitter was in 2015 even before the grades had changed. On this BBC video you can see that a probability question was deemed to be impossible because it mixed in algebra unexpectedly. But this type of challenge will become typical. Let’s examine grade structure and difficulty in more detail. But one of the main points often missed in the coverage is that from September 2015 the new GCSE syllabus and grading scheme started for Maths and English (first results in 2017) while the remaining subjects start a year later. What will this mean for pupils and parents? First of all the grading system is changing from A* down to G, to 9 down to 1, with 9 being the best. 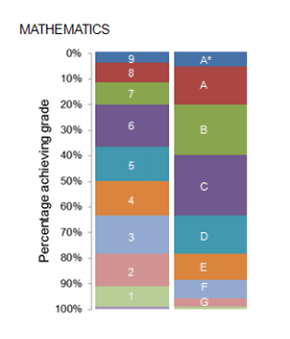 You will see from the chart below that A*/A now cover 9,8 and 7, while the definition of the minimum level for a “good pass” – namely C grade, changes to grade 4. Reasonably straight forward. But parents will have to get used to conversations around “your child is on National Curriculum Level 7c but is expected to get a grade 8”. But that is not the main change in the Mathemateer’s opinion, certainly not in Maths which we will look at in more detail. There is now a foundation and higher paper in Maths, and Foundation will cover grades 1 up to 5, and Higher grades 4 up to 9 (so a slight overlap). But really it is content we should be looking at. It’s not a case of “meet the new boss, same as the old boss”. More formulae must be learned. Back in the day you had to learn all formulae, then it was relaxed, now only a few will be given. Even the dreaded Quadratic Formula has to be learned. More questions of a “problem solving” nature. So a basic question like “divide 100 in the ratio 3 parts to 2 parts” will become something like “Brad and Angelina went to a film and shared a 100 gm box of popcorn in the ratio 3 to 2. How many grams did they each get? And what film did they watch? (OK the last bit is a joke but you get the picture, there is just more to read and understand, more to misinterpret). And that is not all. Remember the “amazing Twitter rant”, as Al Murray would say, last June straight after the GCSE Maths exam. 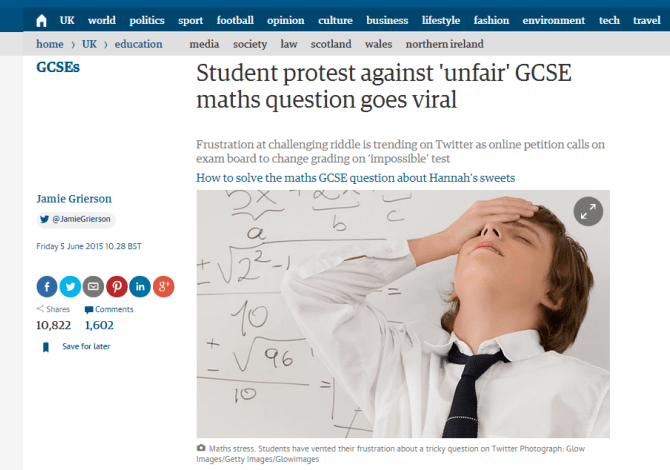 The unfair Maths problem that went viral, (see BBC or Guardian links) involving choosing coloured sweets and ending with a request to prove n² – n – 90 = 0. At first you think, what on earth is the connection? But the point of the question is to reward those who realise there is a connection. The individual steps are not unreasonable (probability diagram, create a formula, multiply brackets, rearrange) but putting these together proved too much for most. Note there was a rumour that the timing of the Twitter storm actually was clocked as starting before the end of the exam. If this is correct then some students either had mobile phones in the exam, or walked out early and the first thing they did was take to Twitter. If so, it confirms my despair! This tricky question was before the syllabus change. This type of question – where techniques across the piece have to be linked – will only become more common. A great presentation comparing grades is attached. It predicts that to get a C 4 in Higher you need around 40% but if you take Foundation you need 70% to get C 4. Is Foundation that much easier? I’m not convinced it is. You could argue that unless you are worried about failing altogether (by getting less than 17% in Higher) you should stick to Higher. The actual boundaries when issued should prove interesting. Finally, more exams: 3 times 1.5 hours exams instead of 2 exams covering 3.5 hours. Some slight pieces of good news for students. A small element of multiple choice will be introduced (always easier in the Mathemateer’s opinion) and the syllabus still does not include Calculus (wish it would, it’s not that hard and would bring GCSEs and IGCSE’s pretty much together). But on the whole the majority of factors above will mean that standards will be raised – that’s good – but more preparation will be needed for a more challenging set of Maths exams. This entry was posted in GCSE new structure on October 2, 2015 by Rick 1.